For the second of Kristen’s two week break between terms, we decided to visit some parts of Australia. 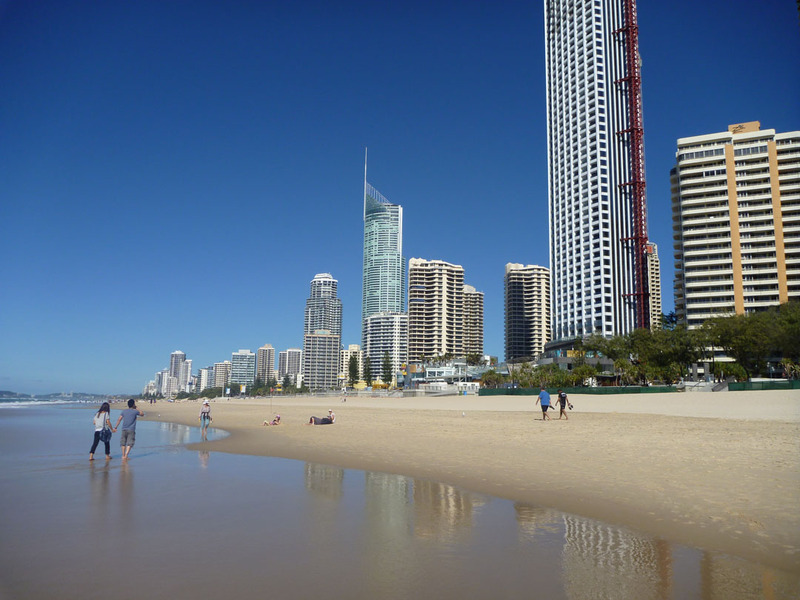 Having already spent Easter in Melbourne, we looked at a couple other options for our next destination, but ended up choosing a few locations in and around the Gold Coast and Brisbane, the largest city in the northeastern Australian state of Queensland. 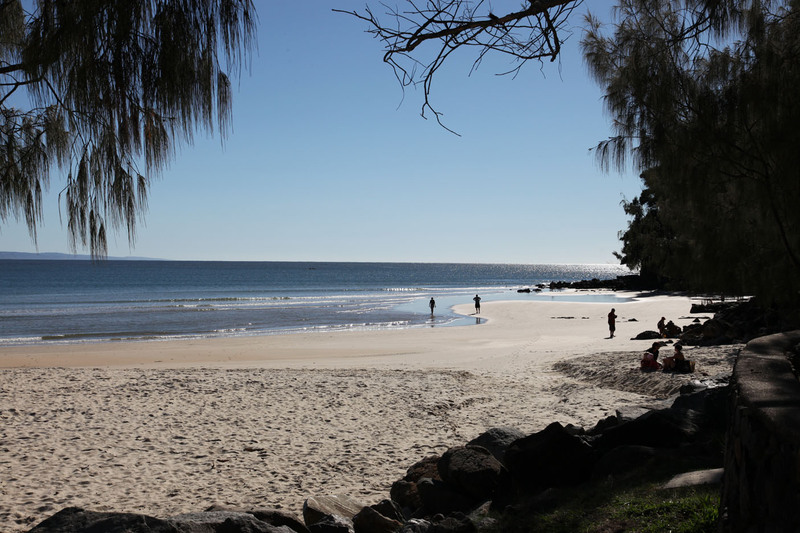 After arriving in the Gold Coast airport and checking into the Sheraton Mirage Gold Coast, we headed north towards Noosa Heads, a small coastal community 80 miles north of Brisbane. 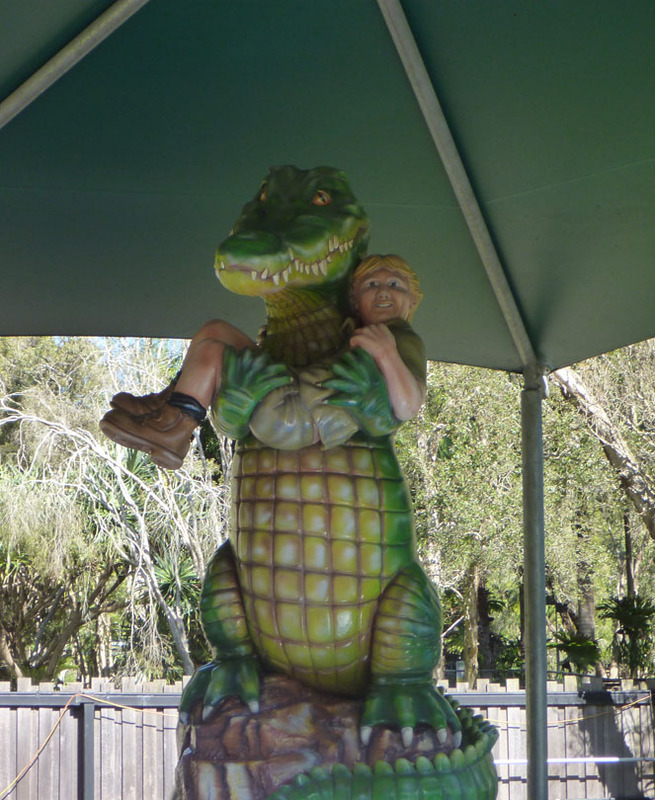 On the way, we made a stop in a small town called Beerwah, home to the late Steve Irwin’s Australia Zoo. 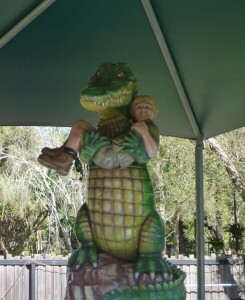 Owned by the Irwin family since 1970, the zoo was made popular by Steve’s “Crocodile Hunter” wildlife shows and continues to be run by his widow Terri. In addition to the usual sorts of animals you find in zoos, like elephants and big cats, the Australia Zoo has a variety of native species as well. Koalas, dingoes, Tasmanian devils all call the zoo home, as do many kangaroos and wallabies, who reside in a large, walk-in section of the zoo and can be hand-fed. Finally, since the Australia Zoo is located in Queensland, holding koalas is permitted by law, so we made a point to have a picture taken with one of Australia’s most famous marsupials. 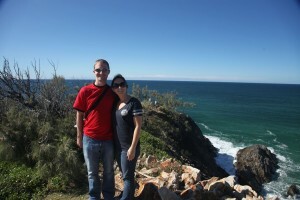 We continued north from the Australia Zoo to Noosa Heads and had some dinner along the main street of the town. 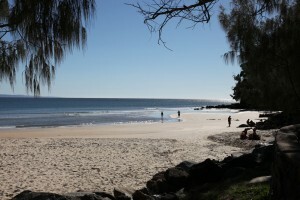 The next morning, we ventured off into Noosa National Park along one of the most popular walking trails. Winding its way along the coast, past beaches and cliffs, the trail eventually leads to Hell’s Gate, a point atop the cliff overlooking the ocean and the park. Having reached our goal, we turned around and walked back into town for some souvenir shopping prior to our departure. On the way back to the Gold Coast, we stopped briefly in Brisbane, the capital of Queensland. Though unable to stay for more than a couple hours, we toured the City Botanic Gardens and explored the Southbank area before returning to the car and continuing on our journey back to the Gold Coast. Taking a break from the long road trips, the next day we met up with one of Kristen’s classmates in nearby Surfers Paradise for brunch before making the short drive to Warner Bros. Movie World, one of the major theme parks in the area. 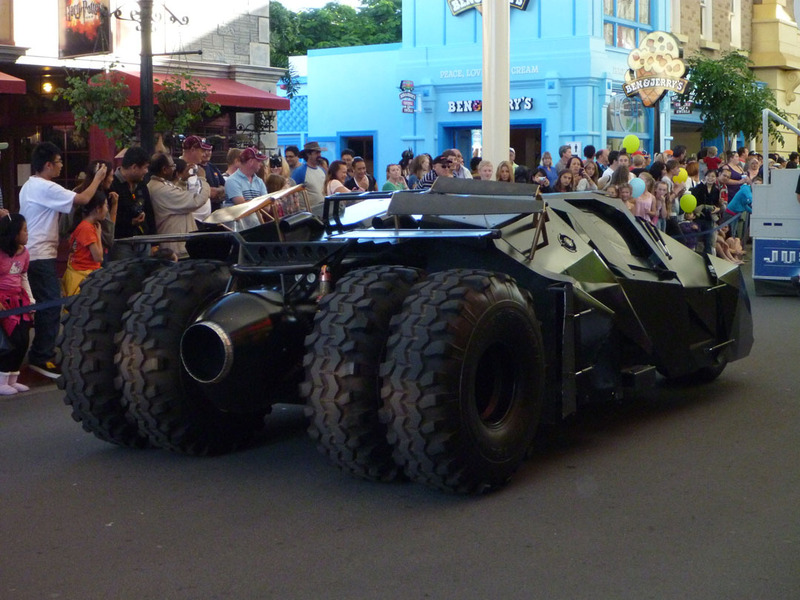 Similar to Disney’s Hollywood (formerly MGM) Studios, Movie World featured rides and attractions based on a variety of films. 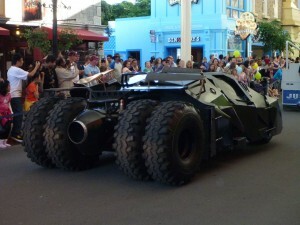 Some of the shows seemed a bit familiar (like “Hollywood Stunt Driver”) and some were just corny (“Journey to the Center of the Earth 4-D Adventure”), but we were quite impressed that a original-looking Tumbler from the Christopher Nolan Batman franchise was part of the daily parade. Our second and final road trip took us south, to an area called Byron Bay. 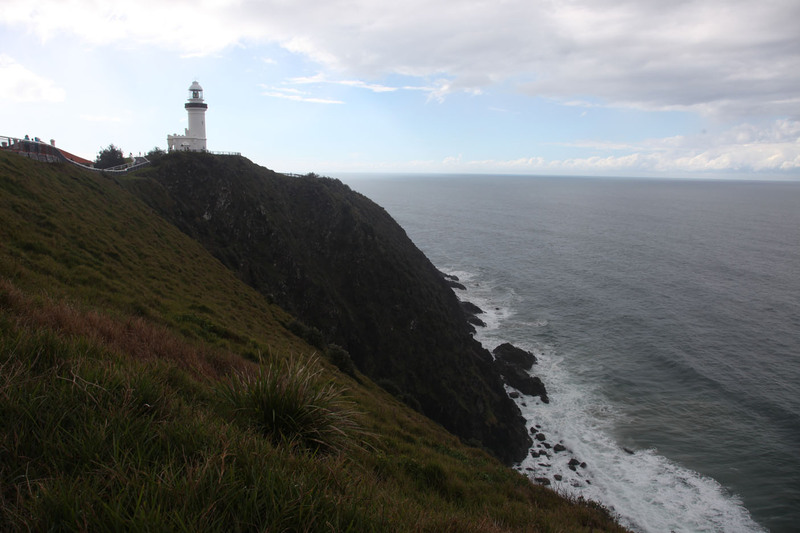 Popular among backpackers and, er, alternative-lifestyle individuals, Byron Bay is also home to the white Byron Lighthouse and the most easterly point of Australia. 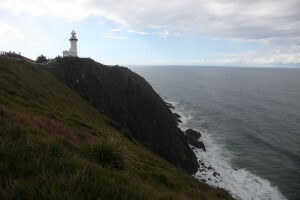 After lingering around the lighthouse until the rain cleared and the sun came out, we ventured into town for some local fare at Fishheads before beginning the trip back to Gold Coast. 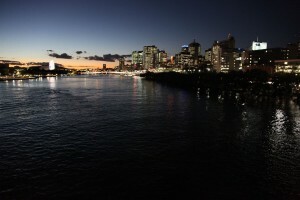 After spending a few days in the area, it’s no surprise that Queensland is nicknamed the “Sunshine State”. 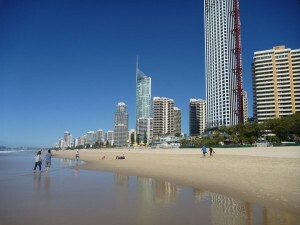 The Gold Coast and surrounding areas were all very welcoming and familiar – Noosa reminded us of Hilton Head and Surfers Paradise was a dead ringer for the Ft. Lauderdale/Miami area. I can’t say with any certainty that we’ll be back, but, for a quick and sunny weekend getaway, the Gold Coast is hard to beat.